Federal Funding For Home Visiting Programs Set To Expire : Shots - Health News A program that provides $400 million in federal funds for the visits expires next month. Advocates and providers hope it will be reauthorized and even expanded, saying it's money well spent. 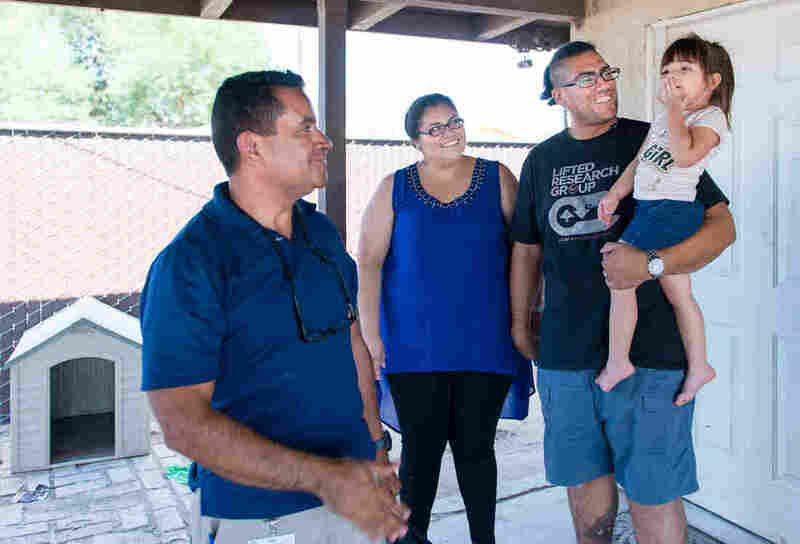 Rosendo Gil, a family support worker with the Imperial County, Calif., home visiting program, has visited Blas Lopez and his fiancée Lluvia Padilla dozens of times since their daughter was born three years ago. Seated at a kitchen table in a cramped apartment, Rosendo Gil asks the parents sitting across from him what they should do if their daughter catches a cold. Blas Lopez, 29, and his fiancée, Lluvia Padilla, 28, are quick with the answer: Check her temperature and call the doctor if she has a fever they can't control. "I'm very proud of both of you knowing what to do," Gil says, as 3-year-old Leilanie Lopez plays with a pretend kitchen nearby. Padilla says that's not a question they could have answered when Leilanie was born. "We were asking question after question after question," she recalls. Gil, who worked as a nurse in his native Mexico, is now a family support worker with the Imperial County Home Visiting Program. He has visited the El Centro, Calif., family dozens of times since Leilanie's birth. At each visit, Gil teaches the couple a little more about child development and helps them cope with the stresses of work, school, relationships and parenting. 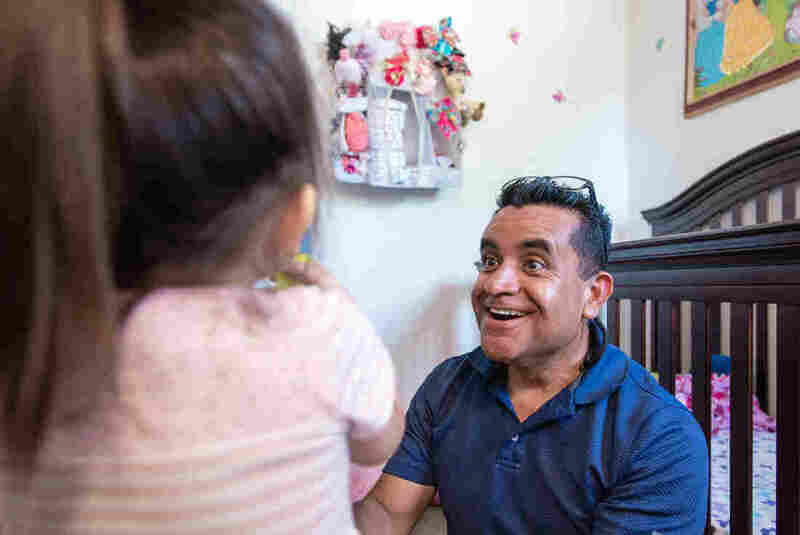 Gil and other home visitors around the nation face a daunting task: to help new parents raise healthy children and overcome poverty, substance abuse, depression and domestic violence. Home visiting organizations operated out of the national limelight for decades until the Affordable Care Act created a nationwide program in 2010 to support them. The federal Maternal, Infant and Early Childhood Home Visiting program now awards $400 million in annual grants to help new families with young children and couples who are expecting. The Imperial County, Calif., program serves roughly 100 families with its $630,000 annual budget from the federal government. Nationwide, federally-funded home visitors reached 160,000 parents and children in 2016, according to the Health Resources & Services Administration. Funding for the program is set to expire at the end of September unless Congress acts to reauthorize it. With the deadline looming, advocates and providers are urging federal lawmakers to reauthorize it for five more years at double the current funding level. Two bills are pending in the House. "Expiration is just not an option," says Diedra Henry-Spires, chief executive officer of the nonprofit advocacy organization Dalton Daley Group and one of the leaders of the nationwide Home Visiting Coalition. "Too many families are relying on these services across the country." Rosendo Gil plays with 3-year-old Leilanie Lopez. He's encouraged her parents to read to her every day. Studies have shown that home visiting programs get results – they help reduce child abuse and neglect and improve child and maternal health, for example. Researchers say home visiting also saves money that would otherwise be spent later on the child welfare system, special education, medical care and other services. Organizations that provide home visits fear that some programs may have to reduce the number of families they serve, while others may have to close altogether if the funding is not renewed in time. Chicago-based Healthy Families America sends social workers, nurses and others into homes in 35 states. Its national director, Cydney Wessel, hears from many participants who say they want to avoid the mistakes their own parents made and raise their children in homes without violence or substance abuse. "Under stressful situations, parents often revert to how they were parented" if they don't have somebody to help guide them along a different path, Wessel says. Lopez and Padilla were determined to discipline Leilanie without spanking her. "I don't want to follow that same pattern," Padilla says. The couple credits Gil with teaching them much about babies over the past three years — for example, that holding them a lot doesn't make them clingy. Gil recently brought Leilanie a book called "Mommy's Best Kisses," reiterating to the parents the importance of reading to her every day. "He's like a friend," says Lopez, a former migrant worker who is studying to get his high school diploma. "We have counted on him." Gil has also helped the couple live on their own and communicate better with each other, Lopez says. He helped them find services when Leilanie's speech was delayed and encouraged Lopez, who has Crohn's disease, to take his medicine. Rosendo Gil, who was a nurse in his native Mexico, works to build trust with all of his clients. Blas Lopez and Lluvia Padilla say Gil has taught them how to better care for their daughter and themselves. Gil says it is crucial to gain the trust of his clients, which he sometimes does by telling them about his own alcoholic father or the challenges he faced raising his daughters. "It opens the door," says Gil. And over time, he sees changes and feels grateful he played a part. "I see parents going back to work and back to school," he says. "I see parents breaking the cycle on substance abuse. I see families becoming role models to other families. ... This is so great to see."